Because finding the best hyaluronic acid moisturizers can be a daunting task, we decided to put to a test 15 of the most popular brands in the market today to find out which of them can live up to their claims. The products that made it to this list have been carefully selected based on formula, added ingredients and skin benefits so we can be sure you only get nothing but the best. 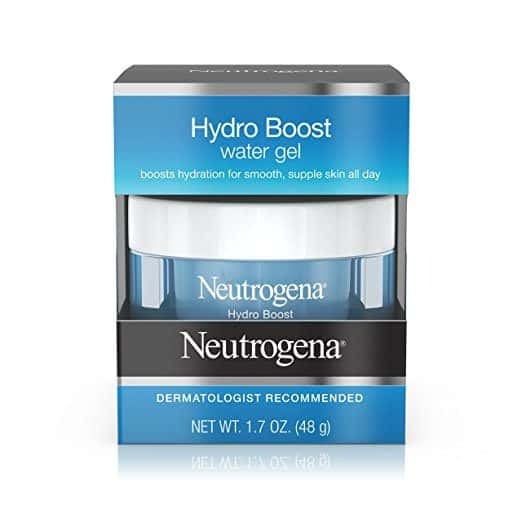 Neutrogena Hydro Boost Gel-Cream is the best hyaluronic acid moisturizer. It’s fast absorbing, noncomedogenic and oil-free. It’s infused with olive oil extract, too. Containing vitamin C, Body Merry Super C-22 Moisturizer has a lightweight and gentle formula your skin will love. It’s able to moisturizer the skin and help boost its health without making you feel greasy and sticky. For really dry skin, choose La Roche-Posay Hyd﻿﻿﻿raphase Intense Riche 24-Hour Intense. It has a non-greasy formula that’s easy to absorb. It leaves a dewy finish to boost your skin’s natural glow. Derma E Hydrating Day Crème with Hyaluronic Acid comes with a handful of anti-aging ingredients. It’s a good choice for mature skin looking for some extra hydration. Home Health Moisturizing Cream is another great option for mature skin. Apart from hyaluronic acid, this one is also formulated with vitamin C and green tea. For the best hyaluronic acid moisturizer, Neutrogena Hydro Boost Gel-Cream tops our list. It promises to keep your skin hydrated for 48 hours. And while it’s formulated for dry skin, the nice thing about this moisturizer is that it can actually work on all skin types. It’s noncomedogenic, oil-free and fast absorbing which means it can fit those with oily and acne-prone skin, too. Apart from purified hyaluronic acid, this product also contains olive oil extract. The ingredient has potent antioxidant properties to protect your skin againts free radical damage. It also has fatty acids that works similar to your skin’s natural moisture shield. What really attracted us to this product is its lack of denatured alcohol. It’s an ingredient which makes most gel moisturizers ineffective. However, one of the downsides of this moisturizer is its packaging. It comes in a jar which means you’ll have to scoop the product out. This can compromise the ingredients and make the moisturizer prone to bacterial buildup. To make sure that doesn’t happen, I suggest you use a clean spatula everytime you’re getting some product. You’ll only need a small amount of the moisturizer so one jar can last you for quite awhile. 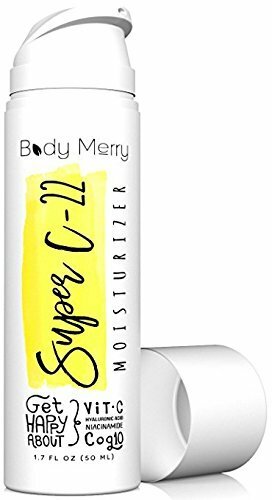 For the best moisturizer with hyaluronic acid and vitamin C, go with Body Merry Super C-22 Moisturizer. It’s lightweight and gentle despite its potent ingredients. This moisturizer contains 20% hyaluronic acid and 22% vitamin C. It also has sunflower oil which can do great things to your skin. You see, sunflower oil contains oleic acid which has vitamin E, qualene and sterols. These three components can strengthen the skin’s protective barrier and boost epidermal moisture. In addition to sunflower oil, you can also find organic aloe vera, shea butter and jojoba oil in its list of ingredients.As for scent, yes, there’s a hint of fragrance in this moisturizer. But, it’s not the type that can make you feel overwhelmed. In fact, I find it refreshing since it’s citrus-y. The product comes in an opaque pump bottle which earned it another plus point. It gives you more control when it comes to dispensing and it’s able to preserve the ingredients inside, too. Plus, it’s a lot less messy. One issue you might encounter with this product is its consistency. It’s a bit thick, so if you’re going to use it under your makeup, you might find it a bit uncomfortable. Use a lighter moisturizer during the day and use this one at night. La Roche-Posay Hydraphase Intense Riche 24-Hour Intense Rehydration Moisturizer is able to provide intense but long lasting hydration. In fact, it promises to provide 24 hours of moisture. Well, we don’t think so. Thanks to its fragmented hyaluronic acid, this moisturizer can soothe dry and dehydrated skin. It has a smooth and nongreasy texture which is surprising for something that’s intensely moisturizing. It spreads easily and leaves no shine. One thing you might not like with this one is its scent. It is fragranced which can turn off those with sensitive skin or nose. It comes in this travel-friendly packaging. Its container is inverted so you won’t to feel frustrated about the product getting stuck in the crevices of the bottle. And it has a pump, too. As for application, it will take just one to two pumps for your entire face. Be easy on application as this moisturizer leaves a dewy finish. It’s not something someone with oily skin would enjoy using. Derma E Hydrating Day Crème with Hyaluronic Acid isn’t just great in moisturizing the skin. It’s also able to decrease signs of skin aging. Well, aside from hyaluronic acid, this moisturizer also has anti-aging oxidants, like green tea, vitamin E and aloe. These three can smooth out the appearance of fine lines and wrinkles while protecting it against free radical damage. Interestingly, the product is also free from parabens, sulfate and mineral oil. It’s cruelty-free and vegan, too. As for consistency, this one is on the thicker side. And because it’s thick, you may need to do more work in spreading it on your skin. Once it sets, however, you won’t have to worry about feeling sticky or greasy. It doesn’t feel tacky, either. Home Health Moisturizing Cream might have a simple name but, the truth is, it’s actually a hard working product. Apart from hyaluronic acid, it’s also formulated with retinol which can help with signs of aging. It also has vitamin C and green tea to help protect your skin from free radical damage. These two are also great in revitalizing the skin. The moisturizer leaves a dewy finish which isn’t bothering even for those who have oily skin. It’s creamy and does a good job in moisturizing the skin. It’s gentle for all skin types since it has no artificial colors, fragrances and dyes. It’s cruelty-free, too. And the best part? It’s relatively inexpensive and its jar contains a lot of product. 4 ounces of cream can surely last you for quite awhile. Hyaluronic acid is a substance that naturally occurs in the body. However, as the body ages, its ability to produce the substance dramatically decreases. And then your skin becomes less pliable, elastic and supple. To control these signs of skin aging, you can use products formulated with hyaluronic acid. Frankly, there are actually tons of products with that ingredient today. If you want to reap all of hyaluronic acid’s benefits, you have to really pay attention to its fine prints. In the ingredient list, always check if hyaluronic acid is at the top. As a skin care ingredient, hyaluronic acid is well-known for its potent capability to replenish the skin’s lost moisture. And it does the job without the risk of overloading your skin with water. Too much water is actually bad for the skin since it causes the substance that holds skin cells to break down. Apart from hydration, hyaluronic acid does a great job in decreasing fine lines and wrinkles, too. Of course, creams and moisturizers with this ingredient don’t work like magic. You have to be consistent in applying and using it. In a research published by the Journal of Cosmetic Dermatology in 2014, it was found out that products that contain hyaluronic acid can decrease the appearance of saggy skin and fine lines in just 30 days of continued use. Take note that hyaluronic acid moisturizers don’t give permanent results, too. But, as I said, if you use it consistently, you’ll get to experience its benefits daily. Hyaluronic Acid isn’t just great for wrinkles and dry skin. It also makes a great solution for sunburn, cold sores and wounds. Since it’s able to keep the tissues moist, it can provide relief. It’s a great help in speeding up the healing process, too. Now, this is a bit tricky as both of these ingredients work really well for mature skin. Nonetheless, less break the facts down. Hyaluronic acid, as mentioned, can be found throughout the body. A huge percentage of it can be found in the skin. Although it’s often referred to as an anti-aging solution, it doesn’t really technically solve the issues. What it does is minimize the signs of wrinkles, fine lines and saggy skin by boosting its moisture. It plumps up the skin to make it look more youthful and healthy. Collagen, on the other hand, supports your body tissues. It’s actually a form of protein that glues together tissues and cells. When used with keratin, it makes the skin firmer and more elastic. Can You Use Hyaluronic Acid With Vitamin C Serum? In fact, using these two together can provide more benefits to your skin. You can use individual products or you can use a product that has both vitamin C and hyaluronic acid. In case you choose the latter, keep in mind that products should always be applied from thinnest to thickest. This means that you should apply vitamin C serums first. Wait for it to be fully absorbed by the skin before applying other products. Hyaluronic acid is one of the best ingredients you can use to combat signs of skin aging. It’s able to retain moisture really well which makes it great for severely dry skin, too. For this best hyaluronic acid moisturizer reviews, N﻿﻿eutroge﻿﻿na Hydro Boost Gel-Cream tops our list. It’s formulated to keep your skin moisturized for several hours after application. It’s noncomedogenic and oil-free. Plus, it’s fast absorbing, too.